A late night craving for some French fries or something equally and sinfully good like deep chicken tenders is something almost everyone has experienced. Although many opt to drive to the nearest fast food chain to get their fried food fix, it’s not very cost-effective or logical to drive, especially when it’s late at night. If you’ve ever been up the whole night craving some good old fried comfort food, but don’t want to drive out just for that, there’s one kitchen gadget that would change your life: an electric deep fryer. Electric deep fryers make deep-frying food easy and accessible. By simply adding enough oil and waiting for the temperature to reach the correct levels, all you have to do is put in your food of choice and wait until it has achieved that crispy and golden brown coating. Although pan frying can give you similar results, it is much harder to achieve a constant and perfect deep-fried outer coating that is juicy and tender inside. If you want to up your deep-frying game at home, the Presto FryDaddy Electric Deep Fryer will make a perfect kitchen buddy. Learn more about this unit’s unique features, the advantages it offers, as well as some of the disadvantages you should know about before making a final decision. When it comes to deep-frying food at home, everyone knows you should be prepared to shell out a lot for the oil you use. This leads to excessive oiliness with the fried food you make while at the same time throwing away money on excess oil. These issues are addressed by the Presto FryDaddy Electric Deep Fryer with its cost-effective 4:4 oil to food ratio. This allows users like yourself to maximize the use of oil every time you fry food for the family which leads to increased savings because you will not waste very much oil every frying session. For those who love to fry their food, but hate spending too much time in front of a stove, will find that the Presto FryDaddy Electric Deep Fryer cuts cooking time significantly. This means you will get your hands on your favorite fried food in less time with less prep, less cooking time, in addition to less cleanup after. This deep fryer may be smaller than other brands, but it does its job very well and has made many users very happy with their choice of deep fryers. An issue many home cooks hate when deep-frying food in a pan is waiting for the oil to heat and then trying to maintain the temperature of the oil. Too hot and you end up burning the food, not hot enough and your food will turn soggy from absorbing too much oil. With the Presto FryDaddy Electric Deep Fryer’s built-in preset thermostat this is no longer an issue. You will be deep-frying food to perfection every time you use this deep fryer. 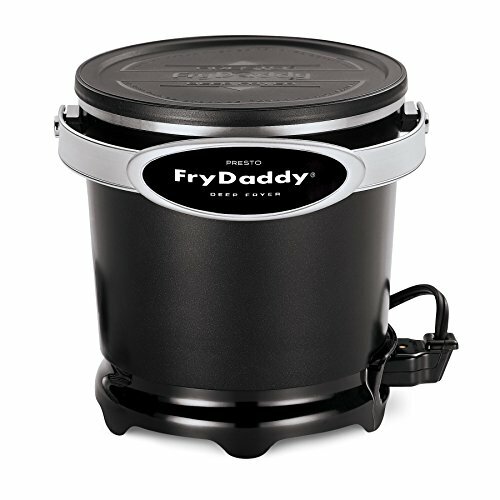 When it comes to the Presto FryDaddy Electric Deep Fryer, you should not expect to fry enough food for a dozen people at the same time. It is very compact and can only accommodate frying food for 2 to 3 people. This is not a good choice of deep fryers if you are planning to make food in bulk. There are other users who have noticed that the Teflon coating inside the pan begins to melt away after just a few uses. If this happens to you, do not eat the food you have just deep-fried and contact the manufacturer immediately. If your unit is covered under warranty you will be able to get a refund or replacement. The preset thermostat means you cannot control the temperature of the Presto FryDaddy Electric Deep Fryer. This can be a problem and become too hot and be dangerous. If you notice that the fryer is getting too hot you should immediately disconnect the unit from the power source and take a break from frying. It will be too dangerous to continue using the fryer when it becomes too hot. Beware and know when to take a break from deep-frying, especially when you are doing it in bulk. When it comes to a compact and affordable deep fryer for the home, the Presto FryDaddy Electric Deep Fryer is a good choice. It is very cost-efficient during initial purchase and its future oil usage. For small deep-frying sessions, this is the top choice.